Like millions of other Americans, Jonathan Marvel, founding principal at Marvel Architects, remembers watching media coverage stream in from Puerto Rico in September 2017 after Hurricane Maria struck the island. The devastation was extraordinary. As later studies would reveal, an estimated 2,975 people died as a result of the storm and 3.4 million people lost power. 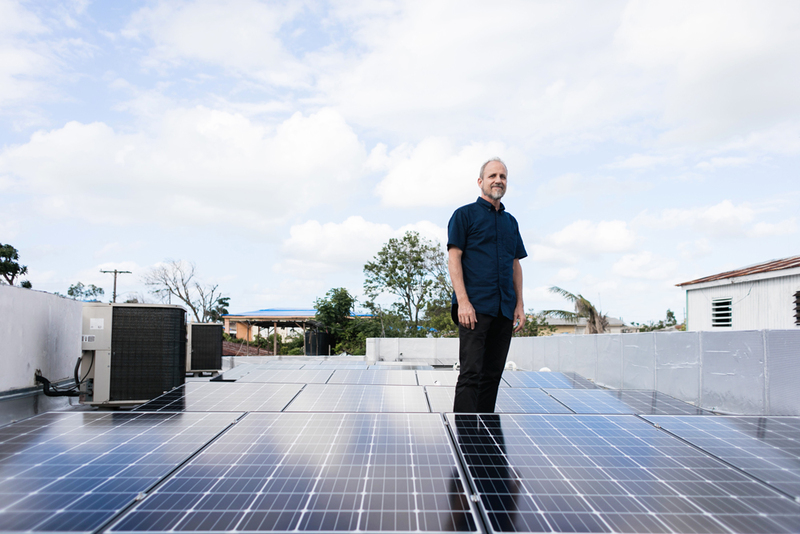 It was one of the worst natural disasters to ever strike the U.S. Now, one year after Maria, Marvel and his partners at Resilient Power Puerto Rico (RPPR) are building a series of solar installations that are bringing emergency power to community centers in informal settlements across the island. Using state-of-the-art Tesla Powerwall batteries, RPPR has enabled these centers to generate solar power during good weather and store it for the blackouts that follow hurricanes and other disasters. Local people can use the centers as shelters where they can charge their phones to find their loved ones, store perishable food, or power life-saving home healthcare devices. The goal of the group was not to rebuild the island's existing infrastructure after Maria, but to provide a new resilient system that would support informal communities when the next storm would inevitably arrive. “When Maria hit," Marvel said, "it hit home.” Marvel had just returned from Puerto Rico when Maria arrived. He had been helping his mother, who lives on the island, recover from Hurricane Irma, which had blown through only two weeks before. Rather than just sending money to aid organizations, Marvel worked with friends and colleagues Cristina Roig-Morris, ESQ, and José J. Terrasa-Soler, ASLA, to do what architects do best: design a solution to a problem. “Architects jump in,” Marvel said. “We’re the first responders from the professional world. We’re trained to think comprehensively; we’re trained to put the social impact first and foremost.” Rather than tackling the entire enormity of the disaster, Marvel's team focused on power. Electricity, as Marvel put it, "is the basis of all things in the 21st century,” and according to CNN, the hurricane caused the worst blackout in U.S. history. The goal of the group was not to restore electricity to the whole island; that would be an enormous task and one that a slew of government agencies were already working on. Instead, they looked at how they could create supports in the electrical web to catch the most vulnerable when they fell. RPPR’s solution is straightforward but steps neatly aside of the established way of doing things. “We’ve been very deliberate to stay outside of local politics and federal politics,” Marvel said. Instead, the group looked for creative solutions permissible under existing laws. The sun being an abundant resource on the tropical island, solar power provided an obvious place to start exploring possibilities, but they found there were restrictions on what they could do with private generation. “Before Maria, there was a lot of solar power, but it was illegal to store with batteries,” Marvel said. “After Maria, batteries were allowed without permits, which allowed us to start our system legally. But we still can’t distribute past the property line.” Across the country, small-scale solar generation is tightly regulated by power authorities that have been accused of trying to squash home power generation so that utilities can maintain a monopoly on the electricity market. Puerto Rico allowed domestic power storage in Maria's wake, but still would not allow RPPR to create an alternative power network. RPPR would have to make the most of small-scale installations. Doing a lot with a little is a common practice in Puerto Rico, where resources don't always flow as easily as they do on the mainland. Marvel’s mother, the architect and planner Lucilla Fuller Marvel, had worked extensively with community centers in informal settlements across the island (her book Listen to What They Say presented a bottom-up approach to planning in Puerto Rico), and the group realized that they could focus on powering existing hubs. By installing solar panels and batteries, each community center was able to serve a broad population with relatively little effort. “Each site serves a population about 3,000–5,000 people because of the density,” Marvel said. Thousands of people are able to take advantage of the basic amount of electricity available at each installation during post-disaster blackouts when the central power grid collapses. The focus on informal communities also helped RPPR avoid federal bureaucracy, which, Marvel said, “was completely caught off guard.” While President Trump has recently insisted that his administration got “A Pluses” for their response to the storm, Marvel saw the situation differently: “The federal government does not have a great track record on the lower 48 when it comes to hurricane recovery…but states really help each other out." Puerto Rico, being an island and a relatively isolated territory in the Carribbean, is often forced to go it alone. "Puerto Rico doesn’t have anybody waiting to help. The governor of Puerto Rico was counting on the feds…but the feds didn’t step it up.” When it came to designing the installations, RPPR focused on efficacy rather than looking for a flashy, aesthetically-driven design. Panels are installed in prosaic rooftop setups, but Marvel said that he looked for lessons from what survived the storm when it came time for detailing, and the results have proved resilient. The project’s successes have won new backers and collaborators, and enabled it to broaden its ambitions. Tesla joined the project by providing their home storage batteries, and a variety of foundations have provided hundreds of thousands of dollars in support. Now the project has 28 installations across the island, with 30 more in the pipeline. RPPR and Marvel’s work in Puerto Rico tells the story of a resilient network of communities, badly battered but bouncing back from catastrophe. It’s far from the narrative perpetuated by the current presidential administration, which maintains that the federal government saved a helpless island from impending doom. The project also presents a model for how architects can engage with their communities aside from multimillion-dollar cultural projects or philanthropic endeavors in remote countries. “I think it is very easy for architects to jump into these disasters and think of these solutions. Architects are really well equipped and we do it all the time.” The design’s success comes not out of formal gymnastics or phenomenological effects, but from the social and political structures the project engages and builds on. Ultimately, Marvel credited the served communities for the project’s success. “It’s a generous population,” he said. “They open up their hearts and their houses to each other.” The project shows that when people are willing to lend a helping hand, powerful resilience is possible. Last Friday, we hosted a party with Architizer at the Dom Showroom on Crosby Street. Valcucine was showing off its latest wares as part of ICFF, including a special line called in glass, with pieces by Thom Mayne, Alessandro Mendini, Steven Holl, and Winka Dubbeldam, who was in attendance with fellow architect-about-town Jonathan Marvel. Other notables included Charles Renfro and photographer Adam Friedberg, plus a few delightful bottles of scotch and duck sliders by Savoy's Peter Hoffman, making for the delightful evening.